So do y'all remember that Lilly for Target collaboration back in April? Well, I definitely do. 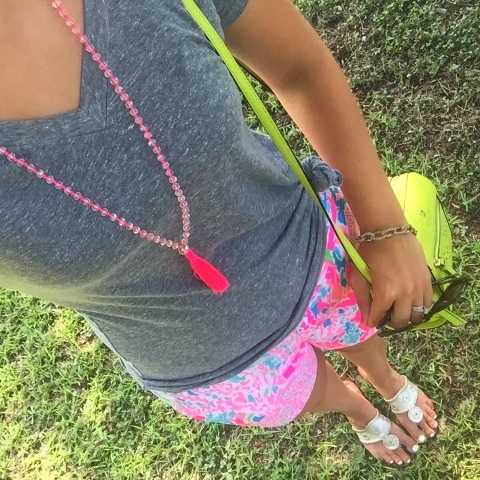 I had never owned anything Lilly Pulitzer but of course I loved the bright, bold colors and patterns. I wanted to get a few pieces at a great price so I literally stayed up until 4 am. I had to be at church the next day at 7 am so going to the store to camp out wasn't an option. I think the idea behind this collaboration was to get girls hooked on Lilly. Give them a taste of the beautiful colors and they'll be Lilly Pulitzer retail customers for life. I got a swimsuit, wedges, a tote bag, and a beautiful shift dress. I loved everything and I thought the quality was great. Last month, I got my hands on my first Lilly retail piece and now I'm obsessed. The color, the quality, and the style is just too perfect. 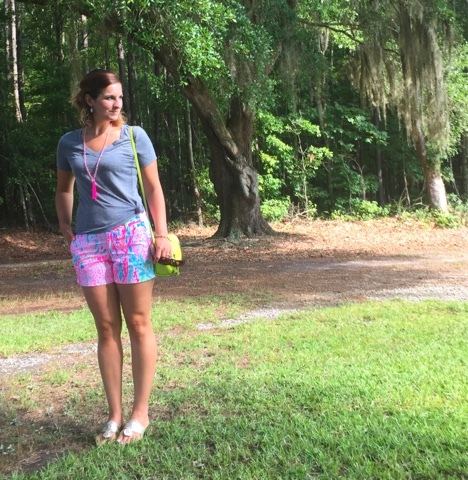 These Let's Cha Cha Callahan Shorts are one of my latest Lilly purchases. They have a 5 inch inseam and are completely mommy friendly while still looking adorable. So comfortable and they don't ride up. Win. I love Lilly.